We are engaged in manufacturing best quality Forged Unequal Tee products. You can collect this forged tee in various shapes, sizes, thickness, and dimensions. This forged tee is offered by us in various metal alloys such as stainless steel, carbon steel, alloy steel, duplex steel, nickel alloy and other. These forged unequal tee fittings are designed by well tested raw materials and this is well manufactured and is able to withstand in extreme high and low-temperature environment. 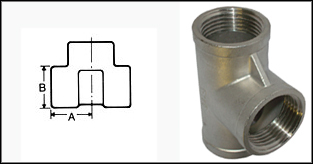 This forged unequal tee is utilized to establish a connection between the two pipes and change the direction of pipe flow. These are designed as per to meet the national as well as international standards and norms. You can buy Forged Unequal Tee from GuruGautam at the best possible market rates. Stainless Steel Forged UnEqual Tee : ASTM A182, ASTM / ASME SA 358, ASTM / ASME SA 312 GR. TP 304, 304L, 304H, 309S, 309H, 310S, 310H, 316, 316TI, 316H, 316LN, 317, 317L, 321, 321H, 347, 347H, 904L. Copper Alloy Steel Forged UnEqual Tee : ASTM / ASME SB 111 UNS NO. C 10100, 10200, 10300, 10800, 12000, 12200, 70600, 71500.